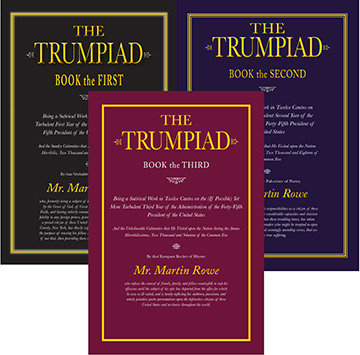 The Trumpiad is an ongoing satirical epic poem in ottava rima (the rhyme pattern of Don Juan by Lord Byron) on the administration of the forty-fifth president of the United States. Currently in its third volume, each month has an allotted canto with stanzas appropriate to its number of days. Book the First is available as a printed book, an ebook, and an audiobook. Book the Second is also available as a printed book, an ebook, and audiobook. All proceeds after costs will be split between Vine, a farmed animal sanctuary in Vermont, and New Alternatives NYC, an organization that helps transgendered homeless youth in New York City. You can read the entire text for Book the First here, Book the Second here, and Book the Third here.